The offer of attending a demonstration of cooking at the Royal Institute by Hervé This and Pierre Gagnier was too good to resist last week. Hervé is the founding father of the science of cooking known as molecular gastronomy and Pierre is a world renowned Michelin starred chef so the chances of picking up some fancy moves in the culinary department were high. The show didn’t disappoint as Hervé showed the possibility of writing recipes with equations to produce infinite variations and Pierre attempted to make something edible out of these chemical formulae. Afterwards, the man from Omlet introduced himself to Hervé who was delighted to share this interesting fact for egg lovers: you can cook an egg in water forever at 60 deg ‘C and it will never change state, but if you raise the temperature to above 61 deg ‘C then the white will start to coagulate. For a perfectly tender egg you should cook it at 65 deg ‘C, never boil it! 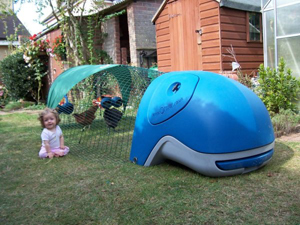 We will be at the Ardingly Show ground this weekend with a full compliment of eglus, chickens and rabbits, you can find out more here http://www.seas.org.uk/shwidx.asp?ID=3 this may be our last show before Christmas so if you want to see an eglu in real life come on down! You can see an eglu at the South of England Show 1st /2nd of October. Kitchen Invaders! 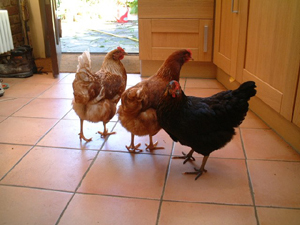 If you see these chickens in snooping round your kitchen please report them to Omlet on 0845 450 2056. There was a question about dustbaths on the forum this week and as my girls love a good roll about in the dirt, I thought I’d tell you all about theirs. They have a special tray with sandy soil in which they use to dustbathe in. It is simply a large greenhouse tray with nice high sides which keeps the soil more or less contained. They all love to lie in it and twist, turn, roll and kick the sandy soil all over them to allow the dust to come into contact with their skins. This helps to rid them of skin parasites and keeps their feathers in good condition. 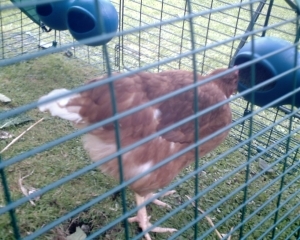 I add a sprinkle of louse powder or some Diatom to the dustbath every few weeks because the hot summer weather brought forth creepy crawlies which make the hens lives a misery with the unpleasant itching. Dustbaths don’t have to be formal in construction although it is a good idea to have them somewhere where they will stay dry for all weather dustbathing. 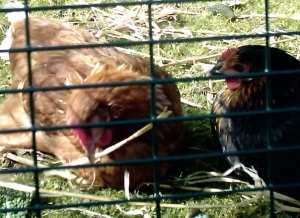 Hens will make use of flower beds or sandpits in exactly the same way and will lie dozing in the sun covered in soil! This week, my girls have made decided to use my vegetable garden which is now empty and have left me lovely hen shaped holes all over it. Dustbathing must be a wonderful thing to do – you only have to look at the blissful way they roll about flicking dirt everywhere to know they’re enjoying every minute. I don’t think I’ll be giving it a try though. My name is Siân Morrison, I am 13 years old. I live with my brother (Joe, 11yrs), my Mum (Kate) and my Dad (Nigel). My hobbies are guitar, card making, chating to my friends and of course looking after the chickens. We live in a town called Clevedon, Clevedon is a quiet place just south of Bristol. 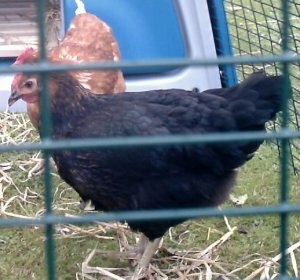 Our pets are 1 black cat (Jet), Several small tropical fish, 1 sand/beige guinea pig (Jack) and 2 chickens – Penny (Miss Pepperpot) Fudge – Before known as Betty (Gingernut Ranger). 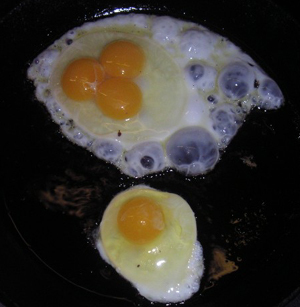 Before we got the chickens we were going to call them Betty and Ethel but when they came the neither looked like an Ethel. The Gingernut looked like a Betty so thats what we called her. The Pepperpot ended up as Penny. They are now called Penny and Fudge. The question you missed is ‘What are your chicken’s favourite treats?’, Penny and Fudge like grapes. Emma Magnus has an uncanny ability to connect with animals. She approaches rabbits with a clarity of thought that makes understanding easy and then goes on to suggest superbly practical solutions to questions that really hit the spot. Although slim this book manages to succinctly cover topics from choosing a rabbit, introducing rabbits, handling, litter training and understanding your rabbits behaviour. Well worth taking the time to read through.